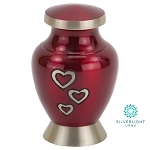 Reflections Urns & Memorials is proud to be able to offer free standard ground shipping and the lowest prices to be found anywhere on express shipping -- only $15.00 for second business day air and $30.00 for next business day air delivery. Our standard ground shipping service uses FedEx. Orders that are received by 3PM EST are personalized and shipped on the same day that the order is received. For orders that are submitted after 3PM, the package will be shipped on the next business day. We can ship to Alaska and Hawaii for a flat fee of $35 per order. This is not an express shipping method, but the packages usually arrive within one week. Second Business Day service is available for just $15 to anywhere in the continental U.S. This rate covers your entire order, regardless of size. With Second Business Day service, if your order is submitted by 3PM EST, your order ships that same day and you receive it two business days later. For example, an order placed Monday before 3PM would be received Wednesday. Next Business Day service (one business day) is available for $30 to anywhere in the continental U.S. This rate covers your entire order, regardless of size. With Next Day service, if your order is submitted by 3PM Eastern Time, your order ships that same day and you receive your order the next business day. For example, an order placed Monday before 3PM would be received Tuesday. Orders received before 3:00PM Eastern Time ship the same day. Orders received after 3:00 PM Eastern Time ship the next business day. Orders are not processed or shipped on Saturday or Sunday. International shipping is available on all purchases at the most competitive rates in the industry. Any package sent to an international address is typically carried by an appropriate USPS international service, but UPS or FedEx international services may be used. Most international customers receive their orders within 10-14 business days. Because packages must pass through U.S. customs as well as the customs of your country, we cannot predict exact delivery time frames. All duties and taxes owed are the responsibility of the purchaser. You may be required to pay such duties and taxes at the time of delivery. 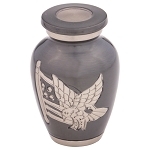 Because duties and taxes are imposed by the purchaser’s country, Reflections Urns & Memorials cannot predict what those costs may be for your product and address. 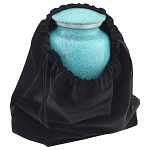 Prices shown are on the Reflections Urns & Memorials website are in U.S. dollars. Can I Place an Order and Have it Delivered Elsewhere? Yes, you can. On checkout, you will have the option of having your order billed to one address and shipped to a different address. If we are provided with an incorrect shipping address, the package will need to be re-routed to the correct address. This will cause a delay. Please be careful to put the correct and complete address in the shipping information section at checkout to avoid this situation. Reflection Urns & Memorials, LLC cannot be responsible for packages that are delayed or cannot be delivered due to an incorrect address, acts of God (such as weather), a mistake by FedEx or other such circumstances that are beyond our control.